The theme for the summit is “Re-imagining the Patient Journey”. Poster competition entries could be from patient groups, charities or individual patient’s – including those who didn’t have a formal diagnosis. 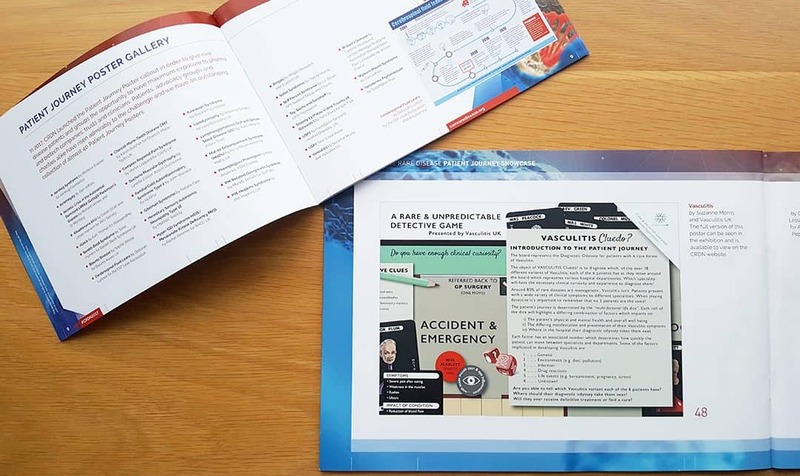 The brief was to design an A0 poster that reflected the Patient Journey, using the 4 headings; Causes of the condition, symptoms and treatment, Impact of the condition & Hopes and aspirations for the future. As a Graphic Designer (and owner of a complex rare disease) I was drawn to the challenge of how to visually communicate Vasculitis from a patient’s perspective to an audience of medical professionals that would including pharma representation, clinicians, students and researchers, patient groups and other Rare Disease stakeholders. Lynn the Vasculitis UK Helpline Support and Research Grant Administrator was keen to help me. When we started talking about the competition Lynn said to me that the “patients’ journey” is becoming a buzzword in the NHS and it would be great to get the message out there about Vasculitis in this way. Lynn and I are both Behçet’s Syndrome patients and we were very keen to have Behçet’s and other rarer forms of Vasculitis featured on the Vasculitis UK poster, and the rare disease summit was the perfect place to get all of them some much-needed attention. Over the summer we set about working out how to explain 6 rare disease patient journeys with the added complication that no two Vasculitis patients have the same journey! While working on the poster Lynn referred to this as the “diagnostic odyssey” and it stuck. I then had the idea of borrowing the concept of a very well known board game and its set of characters… but, with a medical twist! and with a few new of our own creations including the “multi-factorial life dice”. We were selected as 1 of the 5 poster entries given the opportunity to have the poster projected onto the main screen in the auditorium and were offered the opportunity to give a 5 minute to pitch to the audience. This pitch was presented from the patient journey perspective “…if you had 3 wishes what would they be?”. As you can imagine, we were delighted to be told that the Vasculitis UK Poster was selected as the overall winner. 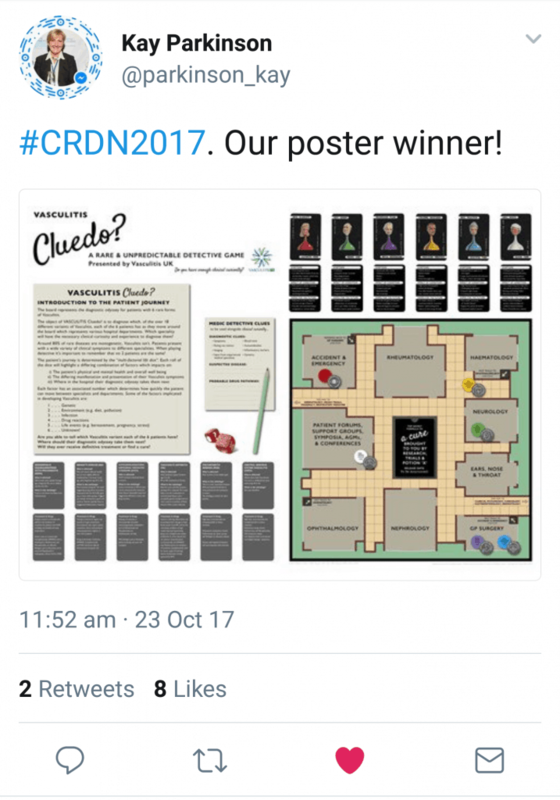 The Trustees of Cambridge Rare Disease Network said “Your poster was nominated as the best overall design for its incredible creativity and impact. The novel way in which the complex journey was portrayed really cleverly draws you in and is extremely memorable. Congratulations to all of you for your contribution to this – you should be very proud!!”. During the Summit, we had an overwhelmingly positive response to the poster and some very supportive comments about our 3 wishes in the 5-minute pitch. The poster will be going along to several conferences this year (having already been to the UKIVAS meeting in London in January) and it will be on display at the Vasculitis UK AGM in April. It would seem that it is rapidly becoming famous in its own right! For photos and more details about the conference and the 5-minute pitch have a look at the Vasculitis UK website.